BiddyKins washable, reusable breast pads have been specifically designed with moms in mind. South African moms were asked to try out various designs and comment on features. 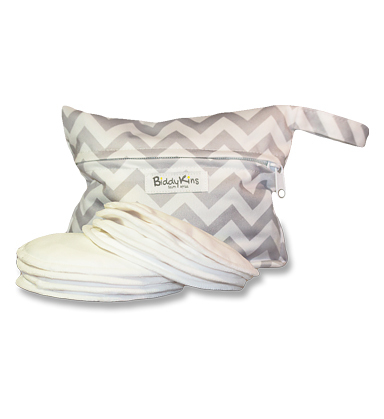 Based on the feedback, we designed what we believe to be the optimal blend of absorbency, comfort and value for money. Breast pads that work ! Each pack contains 8 (i.e. 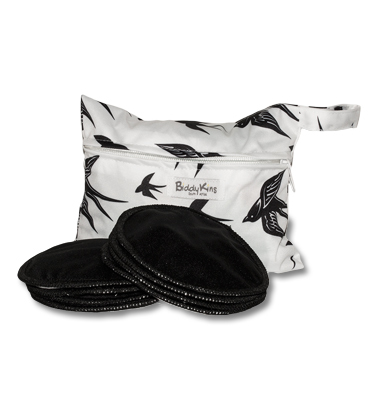 4 pairs) of washable & reusable breast pads. Use regular detergents - but NO FABRIC SOFTENER (don't add fabric softener and don't use "2-in-1" detergents). Fabric softener coats the fibers of the absorbent layers and can permanently prevent the pads from being absorbent.